Story III in the Sperm Donor for a Cosmic Paradox series. Anna Thompson wanted to see her son again. Each event that pushed her further from her son got progressively worse until she ended up bleeding out on a path in the woods. There was a bullet burrowed somewhere deep within her gut. She remembered a television show she watched in high school. The show claimed a gut wound was painful and would take hours to bleed out. The painful part was true for a while. However, the pain receded away to numbness. It was like her body had some sort of defense against pain or she lost so much blood, she couldn’t feel her body anymore. The thought of death wasn’t scary or frightening. She faced her own mortality the moment she time traveled to the past. As a woman of the twenty first century, she never really thought about death. Medical science was really good. Scientists predicted her generation would live for a 150 years. There were always some optimists who claimed medical advancements would make people immortal through tissue and organ regeneration, or even just a robot body to house the consciousness after the flesh body gave out. None of these medical enhancements would be possible for her because of a bullet from the gun of The Gold Piece Bandit. The Gold Piece Bandit was a local hero in his own mind of a town called Underwood, Iowa where she had made her home in the last seven years. He was a bully and rode with a gang. His gang stuck with train and bank robberies from outlying areas, so the town folks tolerated his presence, but they were a rowdy and crude gang. The Gold Piece Bandit would make a show of keeping his men respectable in the city limits, but he was a vile human being. Anna could sense it. Especially the way he looked at her, with a hungry and lecherous stare. Even though she was a waitress in a whore-free Inn, he could tell he wanted her, and she feared the day when he would come take her. When the day came that his lust overwhelmed his sense of being a “respectful” member of the town, she wouldn’t go down without a fight, so she prepared herself. However, no forethought prepared her for what happened. Before the inescapable confrontation, she tried to avoid the gang as best she could until the day they got a new member. The new guy was different. He was pudgy and his skin was burnt like he had never seen the sun until recently. There was a difference between the skin of a person who sunburned over and over, and the skin of a person who stayed indoors and was burning for the first time. On closer inspection of the new member, Anna found out that he was wearing Gucci glasses. Gucci glasses meant that he was a fellow time traveler, and if there was another time traveler, then maybe she could get back home with her son. Her biggest fear aside from her death was not being able to help her son. He was seven-years-old, living in what felt like a Western movie, and she would not be there for him. What began as a path home after being stranded in the past became a series of unfortunate events. The biggest unfortunate event of them all was the bullet in her gut and the abandonment of her son. She could feel herself slipping away. The irony was that she was so close to home. The horn of a semi broke through the traffic noise of the nearby freeway. Not too far away were cars traveling down the interstate. Blood poured from her gut, and her mind slowly faded out of consciousness. To continue reading download the Kindle edition here. Unmanned drones began delivering packages to Sean’s door about three years before the murder recorded by the Hillsboro Police Department, June 23rd, 2019. Sean was more of a manger than an engineer and didn’t really know how the drones fit into the situation until it was too late. Sean was an early adopter of technology because he worked for one of the largest technology companies in the US. As soon as companies like Amazon and eBay had unmanned drones deliver packages, Sean signed up. Sean was sold on the technology when a package of pumpkin spice flavored k-cups was waiting on his door a half-an-hour after he ordered them. He didn’t realize at the time how k-cups would connect to the incident that would alter his life forever. When the drones first hit the air, there was a lot of fear. Rumors spread on the internet about old ladies and pets being attacked by the drones. People feared that hackers would mobilize armies of drones or at the very least steal packages. Some of the more radical websites claimed that the government was using them to spy and wore protective clothing, including the tinfoil hat that an enterprising crazy should have patented in the pursuit of gobs of money. But the drones were better pilots than people. The difference between a drone and person was that people made mistakes. Designers and engineers tested and retested the drones, to ensure the mistakes were worked out their systems before they took flight. Once the fear of new technology subsided, the drones became a fixture of the sky, and no one looked twice, except for Sean. About four months preceding the murder, Sean always looked up, every time he left the house. He would stay in the open air for as little time as possible. Sean often ran from his car to work. A casual observer of his behavior would conclude that he was paranoid, and should probably wear a tinfoil hat if it made him feel better. However, Sean was not loony; he was average. The incident began about nine months preceding the incident in a warehouse located in Gresham, Oregon, just outside of Portland. The warehouse was a wonderland of electronic wizardry because it was entirely automated. Very few humans oversaw a warehouse the size of ten football fields with goods ready to be shipped all over the globe. The workers had all been replaced by drones. On a typical day, an order would come through the internet to a brain that was almost artificially intelligent. It would send an army of drones to pick the order off the shelf, another army would pack the items, and the star of the show, the aerial shipping drone, would fly the package over Portland, to the sleepy town of Hillsboro and on to Sean’s doorstep. Because Sean made a lot of money as a manager, was recently divorced, and had kids who had already been through college, Sean ordered more stuff by drone than any human in the Oregon/Washington area. Rather than go to the grocery store when he was out of peanuts, he’d fly them in. If he wanted a movie to watch, he’d order the blu-ray online. Every product would come in packages of one or two at a time and were dropped off on Sean’s doorstep. Because the warehouse was almost entirely automated, Sean could order at anytime. Drones didn’t make overtime, nor did they require vacation time, or even a forty-hour workweek. If Sean needed to have some milk in the wee hours of the night, a drone would be at his doorstep. He felt as if he was living the dream of his favorite childhood show, Star Trek. The aerial shipping drones and the automated warehouse was the closest thing to replicator a boy could dream, given the technology. An 3D printer could print an object made of a basic material, but a drone and a yearly service fee for free drone shipping could bring him anything he ever wanted. Sean was living in the future. Sean’s future was about to unravel, and it all started with a rose. I am going to change the direction of my blog. I’ll be honest when I’ll say that I started the blog because I envy Dave Barry’s job. Say what you will but I couldn’t think of a better job in the entire world than to write silly stuff every week. So back in 2010, I decided to write silly stuff every week. I figure I would treat it like my job even though I was not getting paid. And sometimes, it did feel like a job. I felt I had to post even though I wasn’t feeling funny. Aside from the December break from writing, I’ve been fairly faithful to the idea. For those of you who have been faithful to reading my silly stuff every week, I humbly thank you for your support and probably would have quit long ago if it wasn’t for regular traffic to my blog. But I have to be honest with myself that my writing energies have been focused on my first love of science fiction and horror (my stories from high school were poor retellings of Ender’s Game, Aliens, and Terminator). I wrote a novel last year and one of the only reasons it’s not out on Kindle Direct Publishing is my wife’s advice to make a go at a publisher. But to satisfy my DIY writing addiction, I’ve been giving out short stories for free when I can on Amazon. The amazing cover art of my story. The next morning Maria woke with a gasp. Her head pounded from drinking a bottle of wine all by herself. She scrambled off the couch and knocked her wine glass to the floor. She was lucky it didn’t shatter. It must have been sleeping on the couch with her. She must have finished the wine because there was nothing but a red stain in the bottom of the glass. She didn’t quite remember falling asleep. She remembered staring out the window waiting for the spirits to come and eat the feast. Her nerves threatened to constrict her throat. Last night was Day of the Dead. She slowly turned her head to confirm her worst fear. It was true. She had fallen asleep with makeup on her face! Now the cheap Halloween sludge was smudged all over her grandmother’s couch! She was such an idiot. She stumbled out of the living room into the kitchen. “Crap. Crap!” she cursed. She caught a glance of her face in the mirror. The once beautiful makeup job was now a complete mess on her face. 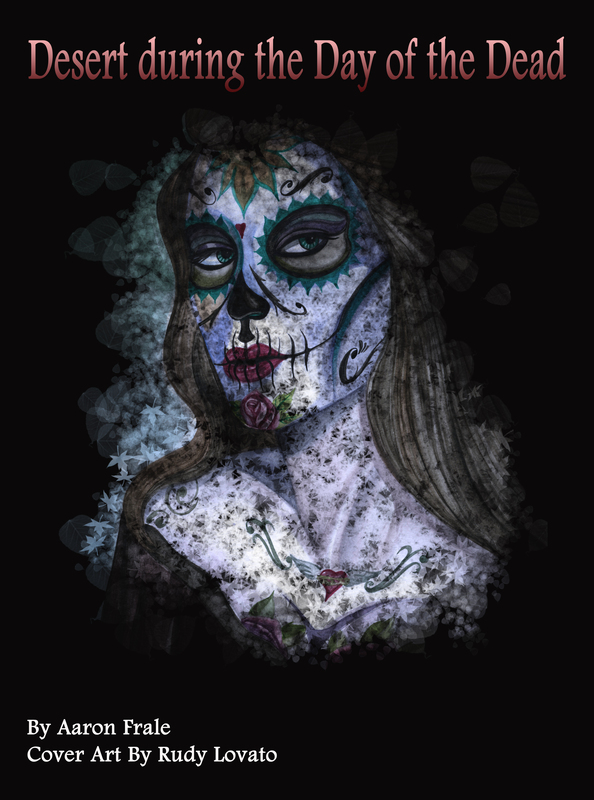 She looked less like a Day of the Dead celebrant and more like a drunken Halloween date. But there was no time to fix her face. Her family would murder her if they found out she ruined the couch. Everything in this house was precious or at least so she thought. In reality, her uncle would probably sell as much as he could on Craigslist after the family picked through the belongings. It was sad really, her grandmother’s last belongings picked away by estate sale shoppers. She grabbed a mess of Kirkland Signature paper towels. As a child, she always thought Kirkland products were from Kirtland Air Force base in Albuquerque. Her mom laughed and told her about the “t” in Kirtland and about far-off city of Kirkland, Washington, home of Costco. Her uncle bought her a giant Costco-sized package of paper towels when she first decided to stay in her grandmother’s ramshackle house. Not that she would use that many during her sojourn in the desert. Her uncle was kind of lazy unlike his sister, Maria’s mom, who was so driven and passionate to the point of being a little too intense sometimes. Maria definitely inherited some of her father’s ability to be okay with doing nothing whereas Mom couldn’t sit still. Maria gathered a giant wad of paper towels. She doused them with cold water following her mother’s advice about getting rid of stains. She brought the still dripping pile of paper towels into the living room when she screamed and dropped the slopping mess. The food on the porch was gone. There was an empty wine glass and a tipped over wine bottle. The burrito, the green chile, and everything else was gone! She carefully made her way to the front door. Even though the morning sun was bright in the sky, she walked like she was in a horror movie discovering a dead body. She wanted desperately to see her grandmother last night. She knew her grandmother was dead. She knew there was no magic in the desert. It was just a fantasy. She pushed open the front door. If she had been in an actual horror movie, she should have a gun or a frying pan but Maria wasn’t thinking. In fact, her eyes welled up as she surveyed the feast. It was really gone. Every last morsel had been eaten. There was no food left on the table. Maria up righted the empty wine bottle. There was a red stain in the bottom of the glass. Maria’s knees buckled. She slumped to the ground and began to cry. To read the whole story download the free kindle version here.